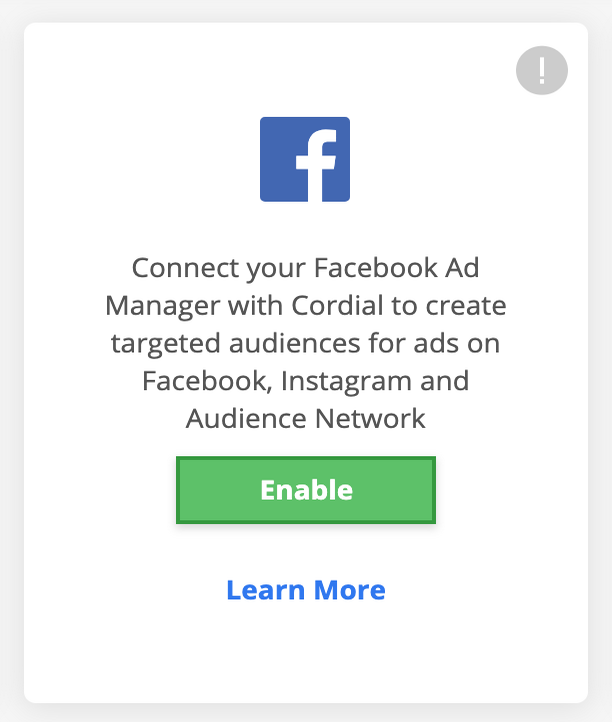 The Facebook Custom Audience integration allows you to target Facebook ads to your Cordial contacts by uploading a new or existing audience to Facebook via the UI. To enable the Facebook Custom Audiences integration in your account, contact your Client Success Manager. A verified Facebook account that is set up to send ads. Accepted Facebook’s Custom Audience Terms. 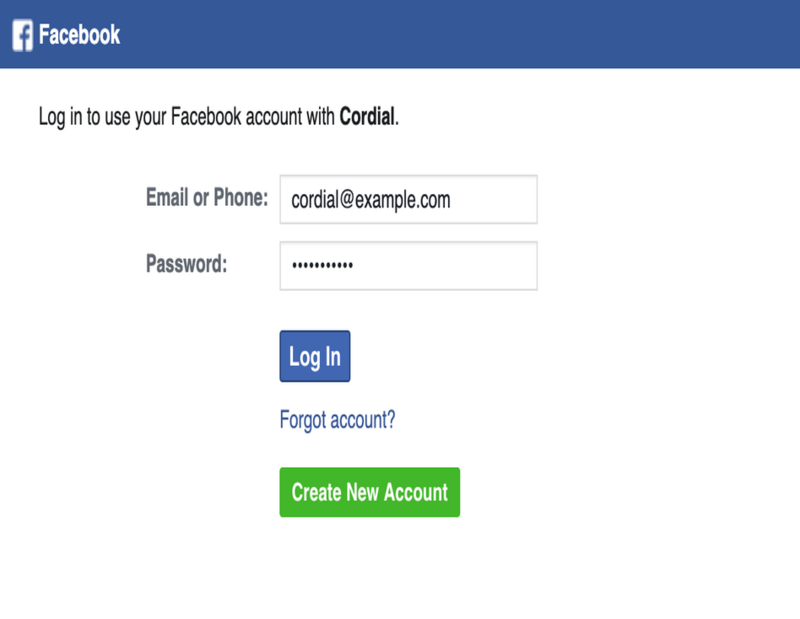 Give Cordial permission to access your Facebook account. 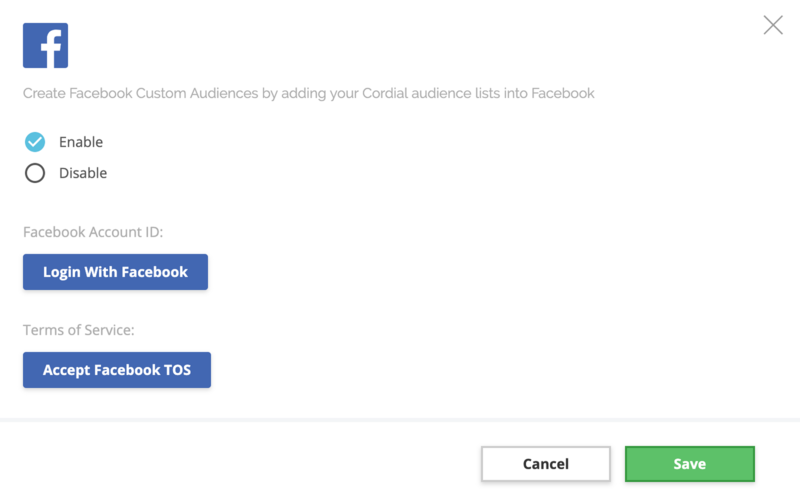 To upload custom audiences, your Facebook app must give Cordial permission to make requests to Facebook. 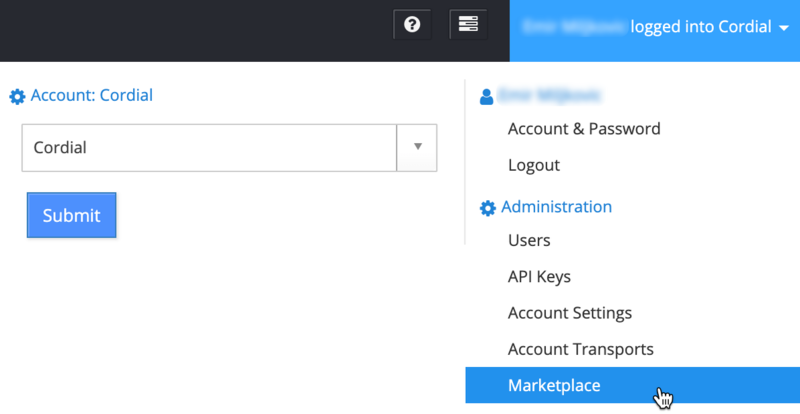 Navigate to the Integrations dropdown in the top right corner. Find the Facebook Custom Audience option. If the option is not visible, contact your Client Success Manager to have it enabled in your account. Clicking the Enable button will show options to configure the integration. Click the Facebook login button to log into your Facebook account that is set up to send ads. Once logged into Facebook, you'll see your Facebook Ad Account ID. If you have multiple ad accounts, you'll see an option to choose the account. The chosen account ID allows Cordial to send custom audiences to Facebook on your behalf. Click on the Accept Facebook TOS button to accept Facebook's terms. To complete the setup process, click the Save button. 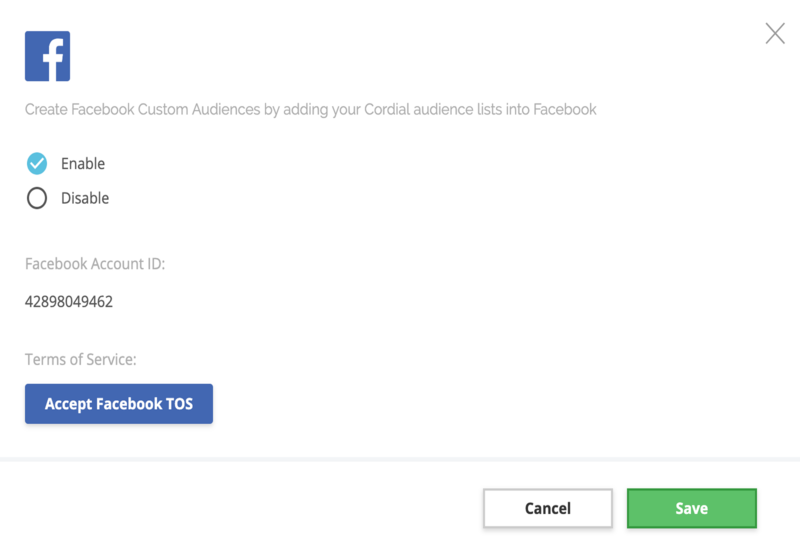 The Facebook Custom Audience integration is now enabled. 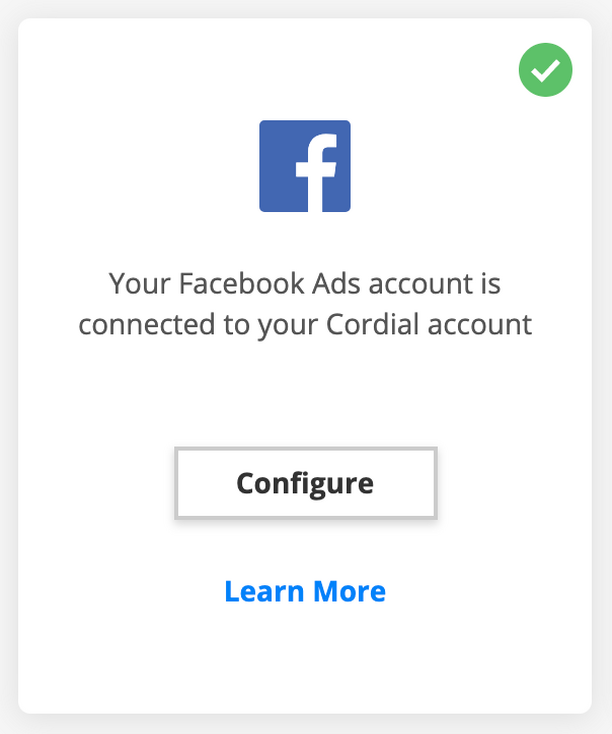 Note: If at any time you want to disable Cordial’s access to your Facebook account, click on the Configure button, choose Disable from the check boxes and click Disable. Navigate to Contacts > Search Contacts. Create your new audience using the rules and filters. 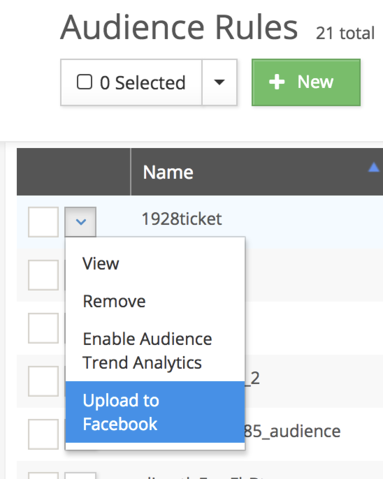 In the Actions dropdown, click on Upload to Facebook Custom Audiences and name your new audience list. Once complete the custom audience list will be uploaded to Facebook. To track the progress of the upload, access the Jobs widget from the top navigation. Navigate to Contacts > Audience Rules. Find the desired audience rule, hover over the arrow next to the name and select, "Upload to Facebook". Upload progress will be displayed in the audience rules table as well as on the jobs widget page. Note: While audiences counts in Cordial are dynamic and may change over time, audiences uploaded to Facebook will remain static with the count at the time they were uploaded. To refresh the contact count in a Facebook audience, it will need to be deleted and uploaded again. Find the desired audience rule, hover over the arrow next to the name and select, "Delete from Facebook".